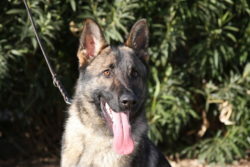 Carl is an agile German Shepherd male, a Real Protection dog for sale. He is an open minded sable German Shepherd from exclusive West German Bloodlines. One of the last Jago vom Zauberberg sons! Easy to handle. All he always wants is to be with people. His temperament is rock solid, like a working German Shepherd should be. His expression and appearance is liked by everybody that meets him. He is trained in protection. His aggression is very serious and NOT training equipment oriented. When he is in protective mode, nobody will come close. His obedience off leash is absolutely reliable. Carl has been around small children and adopts quickly. He behaves very well inside the home. Carl’s protection dog training is completed. He is an excellent companion that enjoys being outside playing fetch! Here an example of his excellence as a protection dog, defending me at the park ! Please scroll down the page to see all pictures! Carl the protection dog starting to physically engage! Protection dog training at Zauberberg Kennels. This 1.5 year old male at third session of reinforcing his aggression against a suspicious person being present during a walk. The decoy reacts and does not act, is important part of our protection dog training. Only after the aggression toward a civil person is trained to the full extend, this German Shepherd might get to bite equipment (sleeve, suit). Training this way will assure that a protection dog is not equipment oriented and defends his owner against an person. The next step, after creating this behavior definitely is to train an on and off switch. ————————– Please note that we do ship our Working Line and Show Line German Shepherds to virtually anywhere in the country including: Alabama: AL Alaska: AK, Arizona: AZ, Arkansas: AR, California: CA, Colorado: CO, Connecticut: CT, Delaware: DE, Florida: FL, Georgia: GA, Hawaii: HI, Idaho: ID, Illinois: IL, Indiana: IN, Iowa: IA, Kansas: KS, Kentucky: KY, Louisiana: LA, Maine: ME, Maryland: MD, Massachusetts: MA, Michigan: MI, Minnesota: MN, Mississippi: MS, Missouri: MO, Montana: MT, Nebraska: NE, Nevada: NV, New Hampshire: NH, New Jersey: NJ, New Mexico: NM, New York: NY, North Carolina: NC, North Dakota: ND, Ohio: OH, Oklahoma: OK, Oregon: OR, Pennsylvania: PA, Rhode Island: RI, South Carolina: SC, South Dakota: SD, Tennessee: TN, Texas: TX, Utah: UT, Vermont: VT, Virginia: VA, Washington: WA, West Virginia: WV, Wisconsin: WI, Wyoming: WY How can we help you?